The Aleader X-Drip Box MOD is a colorful wood/resin style Squonk MOD with a 7ml Squonk bottle. It is powered by a single 18650 cell with a flip-type magnetic battery cover. • Empty bottle. You can buy e-juice at BuyBest too. • No 18650 batteries is included. You shall purchase them separately. • The replacement 7ml e-liquid Squonk bottle and 17ml Squeeze Bottle are also available in BuyBest. Gotta say I am impressed by this squonker. Overall great little mod, resin is nicely done and it's a nice light body. Connections are decent for the price but are a little thin. Squonk bottle is super soft and overall with a pulse rda on it, it hits like a champ. Will have to see what the longevity is. The magnets on the door could use some improvement as they don't seem to be staying put on one mod and seem weak on another. But overall for the price it isn't bad. 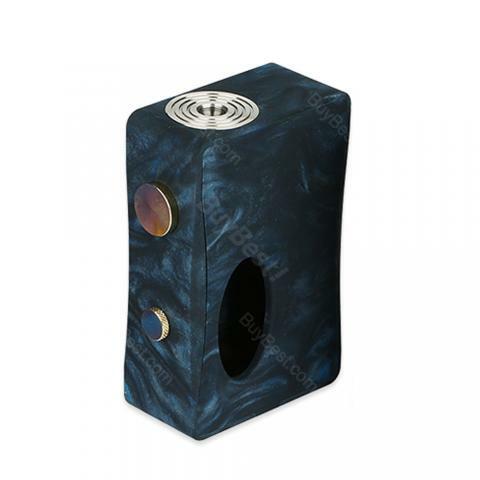 Aleader X-Drip Squonk MOD is a colorful wood/resin style Squonk MOD with a 7ml Squonk bottle. It is powered by a single 18650 cell with a flip-type magnetic battery cover.